I went to a holiday party last night and both drank and a ate a bit closer to bed time than I like to; it seems the food in my stomach when I’m sleeping digests a bit quicker and I tend to spike a bit higher than I might if I didn’t go to sleep so soon after eating. I also walked home from the party and was seeing double down arrows on Dex and a BG of 175 which from experience I knew would either level off at 175 once I stopped walking/went to bed, or would continue to raise one I went to bed and super-digestion commenced. So, I went to bed last night expecting a bit of a BG-coaster but after a comedy of errors, what I got was so much worse. Around 4am, I hear M asking me if he should get me some orange juice. I must have been feeling the low at that point because M usually responds only to my squirming and not to the sound of Dex. I also must have been pretty low because when he asked, rather than saying “no” like I normally would do and getting the juice myself, I said “please” and I put my head on the pillow and let the cold sweat drip over my skin. He brought back a full, tall glass of orange juice (at lease 4x what I would normally use to treat a low) which I drank in two gulps. He got a second glass that went down just as easily. I lay there for a couple minutes to try and let the juice absorb when I decided to actually look at Dex. 58 mg/dL. Not too bad. But 58 wasn’t really a good description of how I felt. I felt sub-zero. So I grabbed my meter and checked. 32. That’s more like it. I went into the kitchen and ate a few spoonfuls of pistachio Haagen-Dazs and Nutella. M came to check that I was ok and laugh and my standing in front of the open freezer with a carton of ice cream and a spoonful of chocolate. I went back to bed and back to sleep. In the morning, I assumed I would be sky high but Dex was only reading in the 120’s. A check with my meter confirmed it. 7 am BG after overnight low. WTF? Where’s my sky high BG that should have followed my massive 4am consumption? 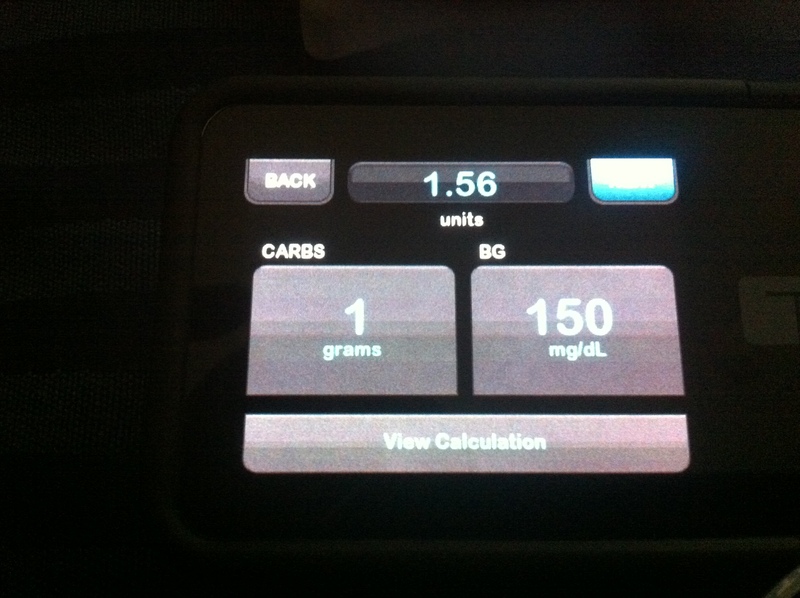 Looking at Dex confused me even more – this low occurred after a rapid drop in BG at 2am. 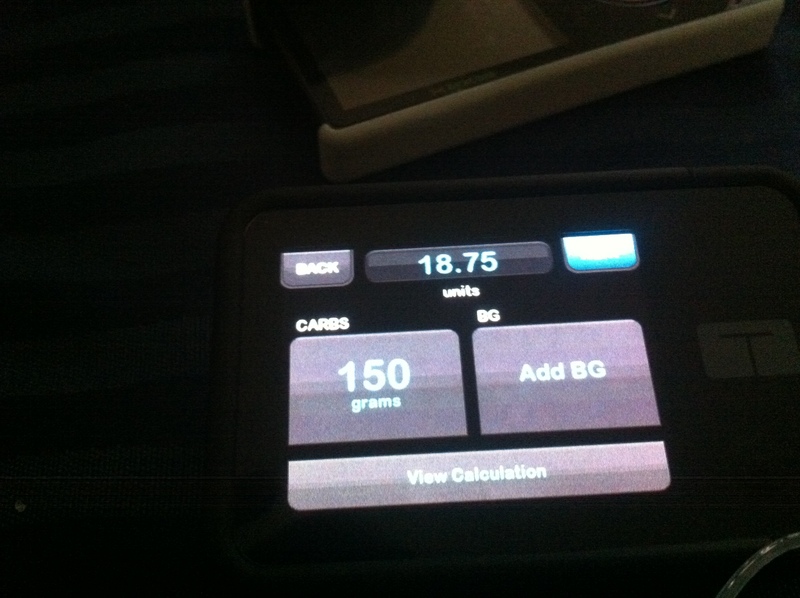 I must have awaken to the sound of Dex alerting me to a high and I must have groggily corrected my BG of 185 (as determined by Dex) and corrected with a bolus from my shiny new t:slim pump. 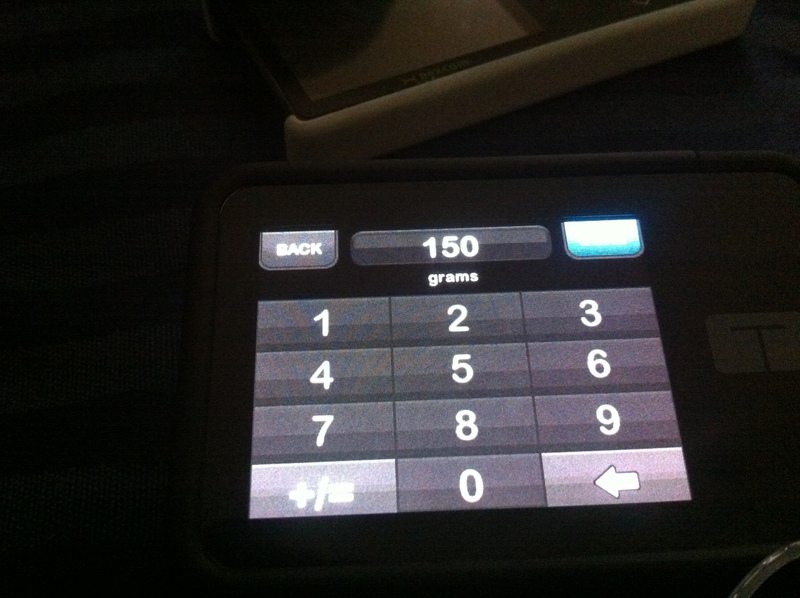 (Now, I know I shouldn’t be correcting from my Dexcom, but I do. And I’ve found it to be reliable enough and even when it’s not the outcome is generally not so far off to be a problem. Generally.) This is the sort of overnight correction I am in the habit of doing, and doing it is barely a blip on my radar and happens mostly on autopilot. So, I decided to check my pump history to see if this was the case. t:slim history screen showing a surprise. Looking at the above image, I was shocked. 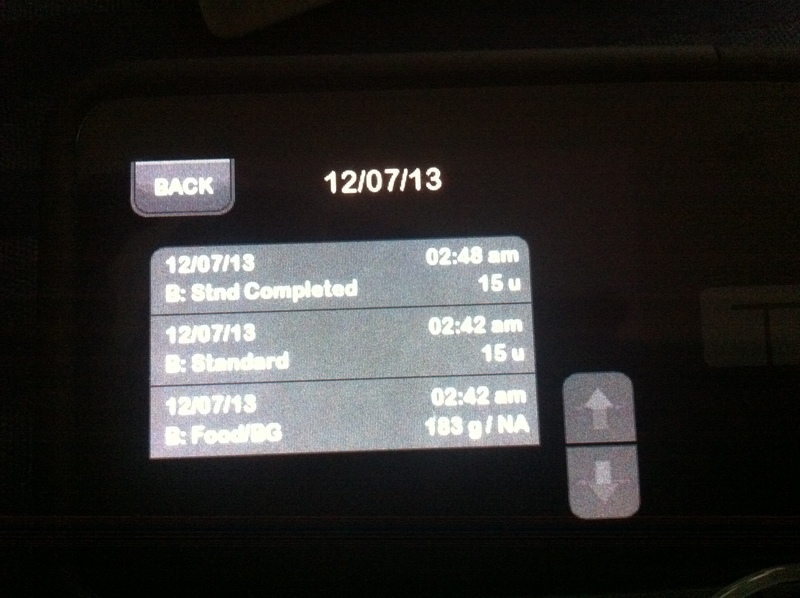 I initiated a 15 u bolus at 2:24 in the morning. Why? Purely by accident apparently. The t:slim displays 3 things for every bolus: the time at which it was completed (boluses can be a bit slow, in this case at 2:48 am), the time it began (2:42 am) and what was entered to initiate the bolus. See in the picture it says “B: Food/BG” then “183 g/NA”? 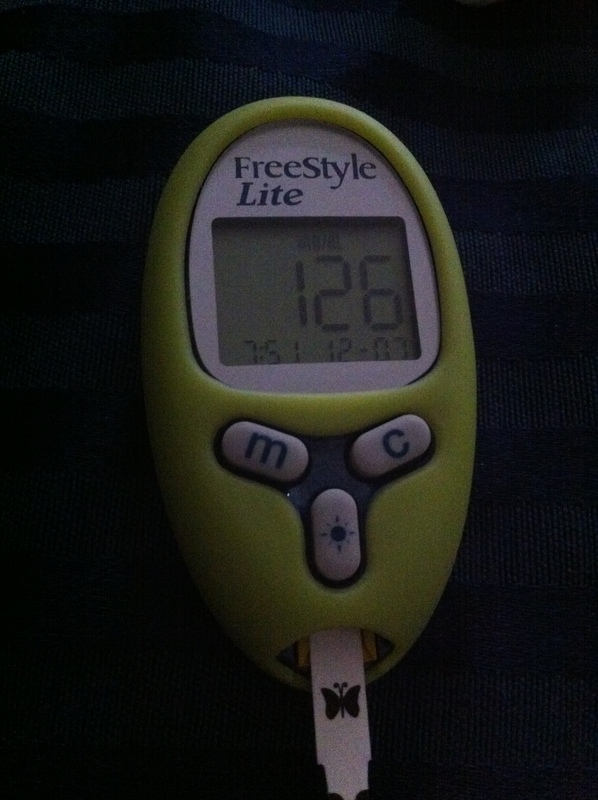 This means I bolused at 2:42 am for 183 g of carbs rather than a BG of 183 mg/dL! What should have been 2 u was 15 (max bolus allowed by my pump settings). How can I make such a stupid mistake? 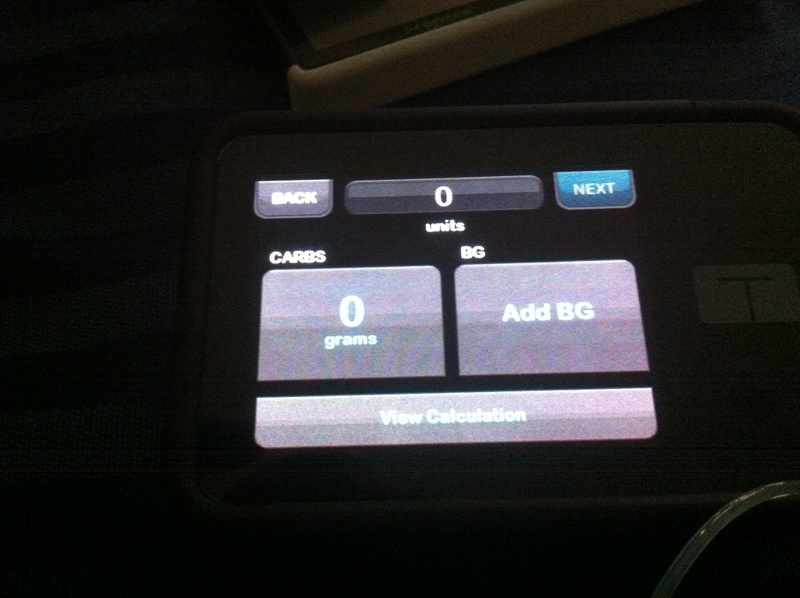 I’ve only been using the t:slim for about a week and I love so many things about it, including that I no longer have to dial in the units for a bolus. However, dialing in that number has always provided me with a check that I couldn’t ignore before delivering a dose of insulin. The t:slim asks me 3 times before delivering a dose; it does a good job of shoving information in my face. What it doesn’t to is engage my brain enough during autopilot to help me see the error of my ways. Once the numbers are entered, it displays a calculated dose then you hit “next”, confirm twice, and done. The bolus initiates and the pump vibrates quickly upon completion. With auto-pilot initiated, I entered and confirmed and was asleep long before the vibration. End of story. The obnoxious dial-a-bolus method used in all other pumps may have irked me most day,s but it did provide me with a mental check that probably would have prevented this from happening. Actually using my meter to confirm my Dex BG would probably have taken my brain far enough out of autopilot to notice my mistake and prevent this from happening. For some reason, my first instinct when I go to calculate a bolus is to click on the left most box first, and when my brain is in BG mode instead of carb mode, there is potentially a problem. I started with the t:slim about a week ago. While I am still smitten by it, I’m realizing I need to approach this change with a bit more caution that I have been. I’ve had Animas’ pumps for about 12 years and I can use one with my eyes closed. I’m going to have to spend some time focusing more on D and destroy my old auto pilot (or at least reprogram it). When my BG goes really low, like sub 55, my tongue always goes strangely numb while my BG is on the raise. There’s a strip down the center that stays tingle free but I could seriously bite off either side of my tongue and hardly notice. Now, combine a numb tongue with a ravenous low-blood-sugar-induced hunger and you have a recipe for disaster. When my BG dips below a certain threshold, and someone asks me a question, I begin spewing fourth every bit of knowledge, gossip, and opinion that I have on the subject. Typically this happens at home; M brings up a friend from grad school or the current Republican primary and I can’t shut up. I’m told that this can be rather entertaining. It’s also a huge cue for M and I that I may be low and we treat it accordingly. But now take this situation into the lab where I work. I wear a lab coat and purple nitrile gloves for most of the day to protect me from the many hazardous things in lab. They also stop me from easily accessing my pump and Dex (all it takes is a quick glove change but I still find this rather annoying) and prevent me from being able to do a finger stick or eat a quick 15g at a moment’s notice. Scene: I am in lab wearing my labcoat and gloves with Dex yelling loudly at me every 5 minutes. I fumble at my pocket in an attempt to quiet the obnoxious wailing (although no one can hear it but me through the constant hum of our spectroscopic equipment) and eventually manage to press the button without having to de-glove. I look at the clock. 4:45pm. Almost time to go home! I look at the computer screen at the 5 open spots om my excel sheet and calculate that I have about 20 minutes left of work before I cal fill in those blanks and go home. I make a decision. The low can wait. In walks BossMan, my supervisor. Side note: WonderBoy is the new hire whom I have strong feelings about. He is ironically named. Me: “Well. ..” and I proceed to tell BossMan about every little thing the guy does wrong that has annoyed me over the last 2 months. BossMan has noticed many of these things too but I can see he is beginning to see WB in a new light. As I’m talking, I will myself to stop. WonderBoy will likely be fine in time, although he is certainly not meeting anyone’s expectations up to this point and I am not doing him any favors right now. Me: “Sorry. I mean scraping off this label – I’m a but unfocused from having sat in the analytical room all day and playing with a blade is probably not a good idea.” I lie. I set down the blade and tell BossMan that I’ll finish cleaning in the morning. I walk out of lab and head straight to my cube to chug a couple juiceboxes. As my BG slowly returns to normal-person levels, I feel terrible about throwing Wonderboy under the bus. Now, I wonder if I owe BossMan, and possible WonderBoy an explanation. After all, I do have to work with him for the indefinite future (although possibly less definite after I ran my mouth yesterday). UPDATE: I explained to BossMan in the morning that I felt I had crossed a line the previous evening, apologized, and asked that he please disregard the things I said about WB. I explained about the low BG and now we have glucose stored in all of the first aide kits. I suppose that means all is good? Ugly 15 day old Dexcom sensors on my arm that prevent me from wearing short sleeves on the first warm day of the year. Having to plan everything from eating to walking in advance in order to keep my BG from misbehaving. Envying my friends who inadvertently flaunt their functioning pancreases (pancreii??) in front of me. Sensitive infusion sites that hurt for no reason after only a day. Having no money to go out and have fun because I just stocked up on pump supplies and sensors. Having to find a job with benefits. Lows whilst out for a walk. Being placed on mailing lists meant for AARP members. Feeling guilty for wanting a brownie. Having all of my pockets occupied all of the time with pumps, and Dex receivers. Always needing to carry a purse to carry all of my D-stuff. Talking to inanimate objects like a crazy person. Lows in the middle of the night. Showers burdened by infusion sites and sensors. Treating M like crap because I’m having a low and he’s just trying to help. Dedicated shelf space for D-stuff. Not being able to wear pants without pockets. I am not a poet. But I have decided to take on the #HAWMC challenge and will attempt to make a post a day on this blog for the month of April. Thus, there will be poetry, and various other forms of creative prose that I am not always good at. During work I sometimes go hypo. I find myself making more typos. Everyone thinks I’m a psycho. Sugar to cause me to mellow. I suppose limerick’s don’t combine well with acrostic poems (or with my lack of poetry prowess)…too bad I don’t just have “Diabe”…oh well. Click to buy at CafePress!